Before we indulge our selves, a quick fact, as usual, people who know your Goan history please feel free to add in the comments about how Neureos came about. Neureos are part of consuada, (sweets sent to neighbors and relatives) and has been heavily influenced by hindu cooking, along with kalkals and shankarpalis. Hope your all set for some multi tasking, heat the ghee so its easy to mix with the maida. 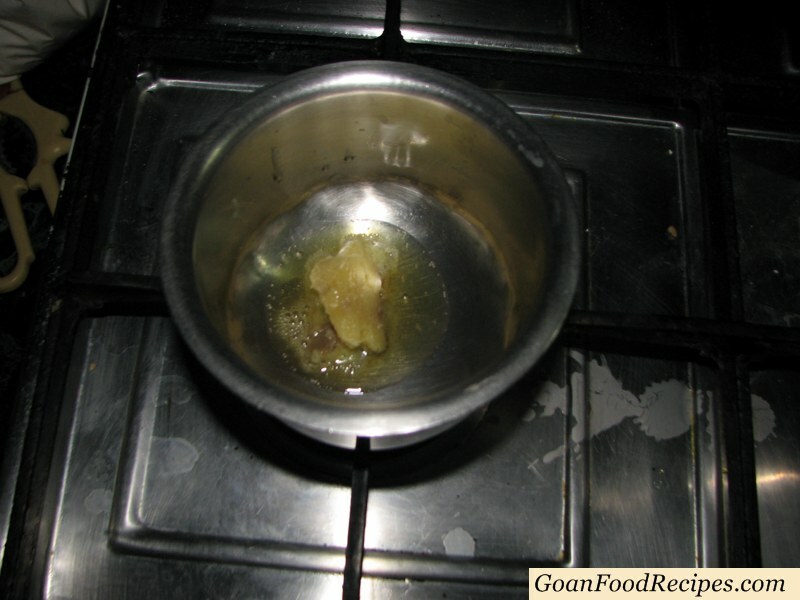 While the ghee is getting hot, roast the rawa on low flame until it turns light brown. As the rawa is getting roasted add the heated ghee to the maida. Sprinkle a pinch of salt and knead the dough. Continue to knead until the dough becomes soft and keep it aside. Once the rawa is roasted, add poppy seeds, sesame seeds and stir it well. Pound the cardamom until its powdered. Add some ghee in the center of the rawa mix. Fry the cashew nuts in the ghee. Before you mix the ghee with the rawa, add some raisins as well. Now its time to add dessicated coconut and stir all th ingredients. Mix all the ingredients for the Neureou filling well. Put in the powdered cardamom and stir it up again. Add the powdered sugar to the rawa mixture and continue to stir. You can drop in pieces of cherry if you like, this step is completely optional, and mix it. The Neureo filling is ready for now, keep it aside and get back to the pastry dough. Divide the dough into small balls and roll out into thin circles like chapatis. Add a spoonful of the neureo filling in the center of the circle. Wet the edges of the neureo pastry so it doesn’t open up and sticks well. Fold the pastry as shown in the picture, you can probably spread the filling a little along the center to make this process easier. You can use a fork to make a small design on the edges or a pastry wheel cutter. Heat the oil in the pan and when hot its time to put in the Neureos. Heres a bunch of Neureous just waiting to be fried! Turn the neureos when the side gets golden brown. When both sides turn golden brown you can take them off the fire. Drain out the excess oil by placing it on a newspaper for a while. A merry Christmas to all of you! Kokad ~ Christmas Goes Coconuts! The preparation is detailed.. hope to try it soon. one query : do we add potatoes in prawns vindaloo?? i had tasted it several times and alwayz it served with potatoes.. i tried to make at home bt didnt like the taste of potatoes in it… any suggession ? Vindaloo does not have patatoes in it… Whether its prawns or pork…many people add patatoes cause they think, aloo from vindaloo means patatoes, but that's not right. I'm goan and just found your recipes by chance. Will be trying many of them as they seem very close to what my grandma used to make.Thanks so much-the illustrations make it so much easy. Thank you for the neureos recipe. will definitely try it. A Merry Christmas to you and your family. After seeing all your Christmas Sweets,i would be making some for Christmas. Just a small query.can u tell me how many neories or kokad or coconut ice becomes in the quantity mentioned in the recipes. I’ve forgotten my recipe book and I’m home for Christmas, looking for a recipe and found the neureos, kulkuls and milk cream here, will be trying them all ?. A Christmas gift to Clyde and the channel and anyone interested, I found the second part to my recipe. 1- Mix cornstarch and ghee in a paste. 2- Roll three thick chapatis. 3- Spread the paste evenly on all the chapatis. 4- Put the chapatis over eachother. 5- Roll into a log. 6- Cut into small rounds. 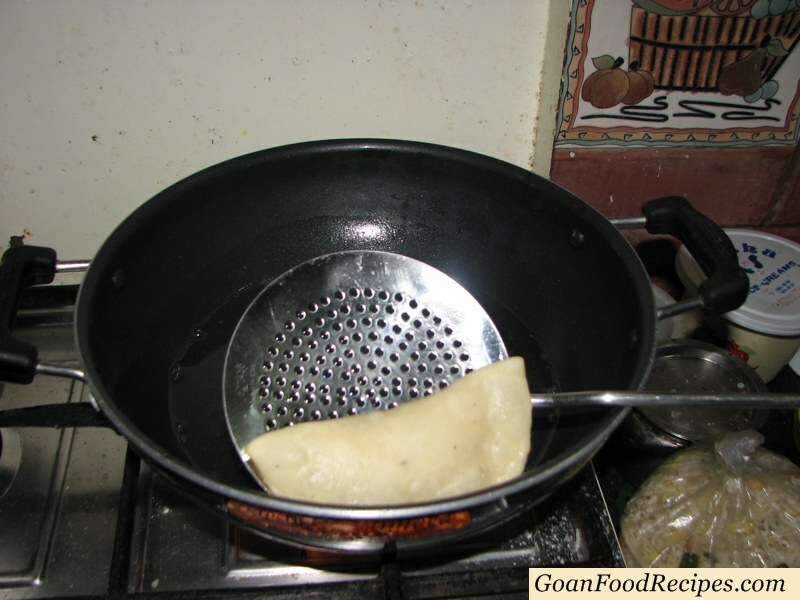 7- Make small chapatis and add the filling as usual. Voilà!! Enjoy the puff pastry neureous. Thank’s a lot for the yumm recipes. God bless you for sharing. Thanks for posting this recipe. Christmas wouldn’t feel the same without Goan Nathal nevrio.